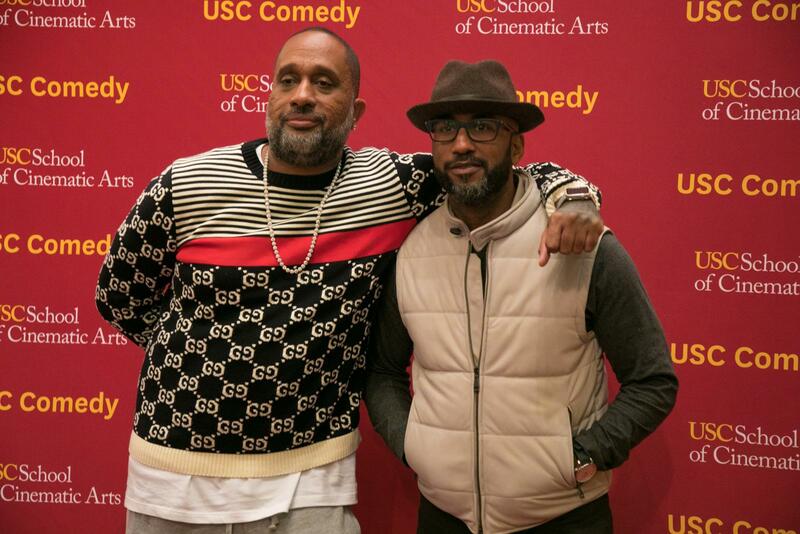 Celebrated TV creator Kenya Barris (left) received the Jack Oakie & Victoria Horne Oakie Masters of Comedy Award from the School of Cinematic Arts, as part of the fourth edition of the USC Comedy Festival. Barris was the guest of honor at the Jack Oakie & Victoria Horne Oakie Masters of Comedy Lecture Series, an evening event held at the Eileen Norris Cinema Theater on November 3rd.. The evening was moderated by SCA alumnus and celebrated filmmaker, Tim Story (right). Barris, the creator, writer, and producer of the hit ABC TV show Black-ish,which he has based on his own life, and also created a spinoff, Grown-ish, which airs on Freeform. He was awarded the Humanities Prize in 2017 as well as NAACP Image Awards in 2016 and 2017 for Outstanding Writing in a Comedy Series. Story, whose credits include the hit films Barbershop, Think Like a Man, and Ride Along, is the first African-American director whose films have earned more than a billion dollars in box office receipts. Barris also reflected on his early days in the industry, speaking about the importance of a strong foundation for up-and-coming writers. It’s important for people to work their way up through the industry, he said, adding that it is critical to learning and understanding how different aspects of the business work. “By the time I was in the writers’ room I felt like I was prepared,” he said. This type of foundation is crucial, he said, and promising writers who don’t have it might not succeed. He also said that this idea of working “from the bottom up” helps build respect and understanding across a set and in the collaborative process: “I learn from everyone on my crew.” In his own career, Barris went from being a P.A., to a writer’s assistant, to a writer, to creator and executive producer. “No one part is bigger than the whole,” he told the audience. Later in the conversation Barris and Story discussed the importance of writers and creators owning their work, stressing that writers should try an have a stake in anything they create. The two talked about the impact that comparatively low-budget projects like Get Outand Moonlightcan have, since films like that are usually owned by their creators. The two went on to discuss Barris’s upcoming work, from his new deal with Netflix—which he couldn’t say much about—to the 2019 version of Shaftwhich he and story collaborated on, with Barris co-writing the script and Story directing. Barris also shared that he was working on a sequel to the comedic classic Coming to America as well as a new project using Bob Marley’s music. That project is an animated film that will incorporate Marley’s music in a type of “love letter to Jamaica,” he said, adding that Marley’s family had given him full access to the reggae pioneer’s music. He joked that: “I was going to get a Bob Marley tattoo, but everyone talked me out of it.” Barris also said he hopes to try his hand at directing once the right project and opportunity presents itself. The night ended with questions from the audience. 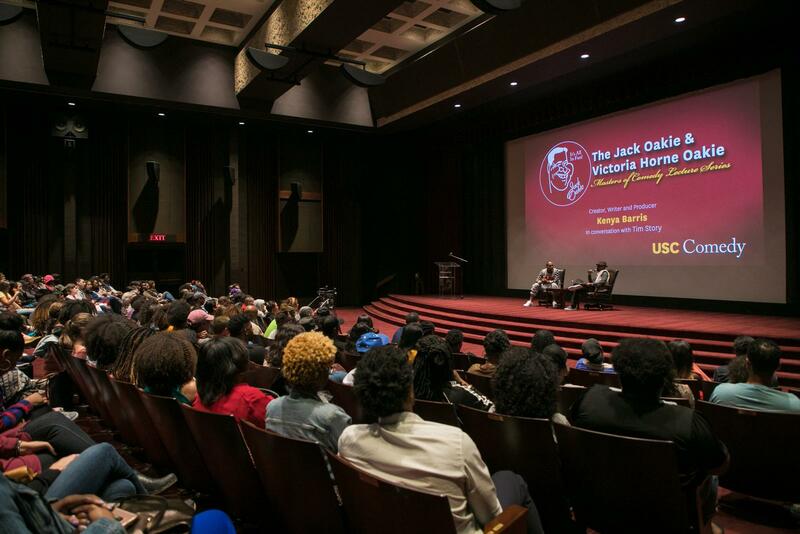 Afterwards, Barris and Story were both honored by the Jack Oakie and Victoria Horne Oakie Foundation with scholarships in their names that will be awarded to School of Cinematic Arts students next year. In accepting the award, Barris gave a thank you speech where he stressed that those who wish to create comedy should know the importance of its impact. He said comedy reaches people far beyond what we imagine, and that with media, artists can change lives. “It’s important to not get lost in the glitter and to make products that we support, are proud of, and are overall representative of us,” Barris said.